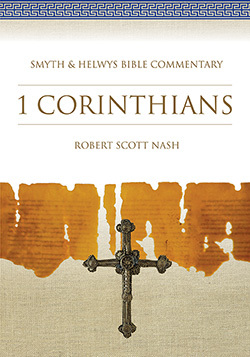 Perhaps more than any other “book” in the New Testament, 1 Corinthians offers readers a window to the life of the early church. Through this window we catch a glimpse of a community of faith struggling with questions of identity, relationship, belief, and practice. Yet our vision through the window of 1 Corinthians is not without significant limitations. The author of 1 Corinthians, the apostle Paul, has framed the shape of the window. For the most part, we can see only what Paul wished to expose and only in the ways he wished to expose them. We cannot know beyond any doubt that his presentation of the situation was an accurate reflection of that situation, nor can we be certain that we even correctly understand what Paul presented. As a part of the canon of Christian Scriptures, 1 Corinthians holds a position of authority for Christians who believe it can still “speak” to them in matters of identity, relationship, belief, and practice. This commentary proceeds in the conviction our “hearing” is enhanced by our “seeing.” The better we can see through this window into the life of that early faith community, the better we can hear the message of this part of Scripture. To that end, this commentary tries to obtain as clear a picture as possible of that community to which 1 Corinthians serves as a window, and looks carefully at the shape and texture of the window itself. Robert Scott Nash is the Columbus Roberts Professor of New Testament in the Roberts Department of Christianity in the College of Liberal Arts of Mercer University in Macon, Georgia. Before that he was the Barney P. Averitt Professor of Religion and chair of the Department of Religion and Philosophy at Brewton-Parker College in Mount Vernon, Georgia. He has also been the managing editor for Mercer University Press and the senior vice president, book division, for Smyth & Helwys Publishing. He is currently the senior editor for the journal Perspectives in Religious Studies and the project editor for the Smyth & Helwys Bible Commentary series. He is the author of The Church as a Pilgrim People and the editor for books on Galatians, Ephesians, and the Sermon on the Mount.